DeLena Ciamacco: The Real Estate Expert: NEW LISTING IN MOUNT STERLING! A HORSE LOVERS, BIRD WATCHERS & HUNTERS PARADISE! 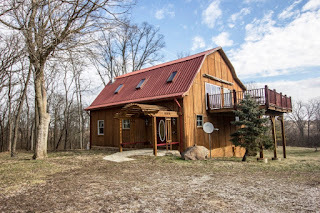 Nearly 100 acres with ~70 acres of hardwoods (loaded with deer & wildlife), walking/riding trails and a 3 level stocked (bluegill, catfish & bass) pond with dock & waterfall! A man-made bridge over a meandering creek. ~15 acres of tillable land. Completely remodeled ~2,600 SF cabin (once a barn) with original wood, pegged oak beams and columns. Giant vaulted & beamed Great Room. Country Kitchen with vaulted ceilings, skylights and corian countertops. 20 x 40 Barn. Near Deer Creek State Park & Golf Course. 3 BRs & 1 Full Bath. Miami Trace schools. Only $699,900! Call DeLena today!